This week First Graders got to hear a book written by a former Cold Spring Student! 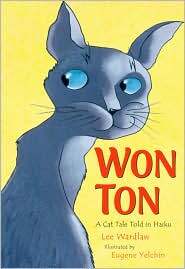 WonTon: A Cat Tale Told in Haiku is Lee Wardlaw’s recent picture book and it was a real winner with students. It’s the charming tale of a cat who is rescued from a shelter and behaves in typical cat fashion. This is one of those books with layers and it can be read as the charming tale that it is, or it can be used as a great introduction to a lesson on haiku. First graders begged to be the first one to check it out. We had to hold a drawing! We are so lucky that Lee will be giving an all school assembly next Fall! Kindergarten–Mo Willems’ Knuffle Bunny series is one of my favorites to read with kindergarteners. Not only can they relate to the stories, but they are transfixed by the illustrations that mix photos and drawings. We had a great discussion about how the illustrations in a book help make the story seem real. For the next two weeks, we’ll read the sequels. Second Grade–Margaret Mahy has such a delightful sense of humor and one of my favorites of her books is the one I read to second graders this week, The Great White Man Eating Shark. Poor Norvin was not the best looking of boys but he made a very good good looking “shark” as he devises a devious plan to get the beach to himself. Students love the twist at the end as Norvin encounters a female shark and decides to sit out of the water for the rest of the summer….or maybe forever! Third Grade–Third graders missed library this week due to the Spring Sing. Fourth Grade–Fourth Graders missed library this week due to the Spring Sing. Sixth graders–Sixth graders brought their citation information for bibliographies of their research projects to the library and I helped them compose their bibliographies. Remember……time to “round up those Library Books! We only have 2 more library sessions this school year!